Lit from a bright steady light from within. A light that is anchored in my deep self and tended by a sure hand. That’s how I feel today, six months after publication of my first full-length mystery novel, “Saddle Tramps.” Six months after being dazzled by the appearance of my actual, hold-in-your-hand book bearing the promise of a serious, ongoing fiction-writing career. Six months after madly scrambling for visibility, and racing on a dimly lit path to full time … Authordom. Today I feel not only lit from inside with a light strong enough to sweep the road ahead, but also with a power that can sustain when shadows loom. What’s made the difference? One word: Mentors. A gathering of readers and supporters, yes. Many with words of praise or advice. And a modest sheaf of good Facebook comments, and Amazon and Goodreads reviews. The accumulated positives have an effect I pay attention to. They are like a thousand candles in the dark. They enable me to move, if haltingly at times. Get things done. So, a heartfelt thanks to you friends out there with candles, flashlights and lit-up cellphones. However some mentors have marched forward with virtual beacons. I think here of a handful of best-selling, longtime career authors who’ve been there and are doing what I, at the start of this fickle career, hope to achieve at least to a modest degree. Authors such as Stella Cameron, Libby Fischer Hellmann, William Dietrich and J.A. Jance. First, Stella Cameron — a wise and witty transplanted Brit whom I met in Seattle some twenty years ago when I went to interview her for a feature for The Seattle Times. Dazzled by her decades-long output of romantic-suspense and mystery novels, I also felt bonded at once. Stella said she occasionally gently guides other writers starting out. She also loves animals, and is fascinated by Native American culture. Then Stella read my “The Stone Horse” inspirational novella … and, to my surprise, not only loved it, but also trotted out to buy her own little Zuni carved fetish (power) animal. After I returned to Oregon in 2006 to write fiction, we stayed in touch, she always rooting me on. For the “Saddle Tramps” book publication this past spring, Stella — madly dashing for a deadline of her own — provided my first cover “blurb.” I was over the moon at this recommendation from an author who has sold millions of books and made the major bestseller lists. Just this past Friday she called me for an amazing conversation, which has sparked this blog post. First she thanked me for my Amazon five-star review of “Folly,” the cunning first book in her Alex Duggins mystery series set in an English village. Second, she offered timely advice about where to go next — and immediately, as time ticks loudly for a writer launching a new career after age 70. Never mind the Pepper Kane short story/novella I’ve wrestled with for longer than a month. I should have been moving full-speed ahead with a new book. Wait, I said. I can use those 40 pages slightly rewritten, in the new book. “Great idea!” Stella said. Meanwhile, I should send PDFs of “Saddle Tramps” to the big reviewers ASAP — it’s not too late. Stella writes two books a year. She believes that I, whom she calls an already good writer, should be able to write one (with all that entails) in seven or eight months. I can try! Which brings us to my second big mentor, best-selling thriller writer Libby Fischer Hellmann. She was assigned to me, when I requested a free, marketing mentor, by Mystery Writers of America. Libby’s first advice was to have Sue Trowbridge of Interbridge, redesign my self-designed WordPress website, which you are experiencing here. Libby’s second prompt was for me to write a mystery sequel novel to my first one, as fast as possible. Great minds do think alike. Pulitzer Prize winner and NYT Bestselling Author William Dietrich provided another book blurb. He penned a nifty blog featuring me and two others on “Perseverance” in the Huffington Post,” and also said, “Keep going. You’re on a roll.” Or words to that effect. Mega-selling mystery maven J.A. Jance, another Seattle homey with whom I keep in touch, said to produce another book as soon as possible, and to “grow your email list to let readers know the moment you have new books and other offers for them.” See a theme, here? Monday Mayhem, my mystery-writers critique group headed by crime-noir/thriller author Tim Wohlforth, offers the same advice: Write forward! Do the stories and other projects later. My takeaway from all this? Three little words: Mind your mentors. Small or large, many or few. Listen. Then take the action they suggest. Especially if they all say virtually the same thing. And so now, newly inspired and fully illumined, I must say goodbye, and thanks for reading. I must write off into the sunset! A new Pepper Kane mystery awaits over the horizon. What does a writer do when she’s stuck on a great story she’s rewriting, and can see no earthly way to get unstuck? When she has this idea that she loves, and that she’d love every bit as much if it were penned by another — perhaps, better — writer? But that needs a ton more work, major surgery even, to make it shine? Happens all the time, you say. And even to those “better” writers. They feel an in-progress story or book is not quite right. Worse, the writer’s savvy editor or writing critique group confirms the suspicion, offering small tips or corrections here, comments about bigger changes, there. But no clear “aha” suggestions on how to re-boot or re-organize the piece so it works! This is what’s happening with “Over the Edge,” my new Pepper Kane mystery story/novella. 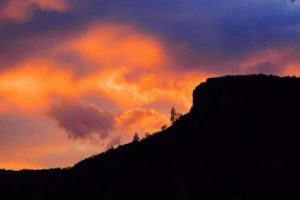 In this story, Pepper tries to stop someone with a murderous urge from pushing another someone over the edge of Southern Oregon’s Table Rock. And it’s driving me bonkers. My mind fiddles around with it 24/7. Sometimes actively, sometimes in the background when I am doing something else. This has gone on for more than a month. So I go out to breakfast with my long-suffering hubs. Ride my horse. Read other writers. Kvetch to friends. Lose myself in TV news. Listen to rain pelting our home’s old bubble skylights. Especially listen to rain on the old bubble skylights. So soothing, so hypnotic. Poppity, pop, pop, pop! I know the answer is inside that story, or my battle weary brain, somewhere. So here I go to dig again, tear apart, restructure, stitch back up, and dig, tear, restructure and suture some more. Which version will live? Which will stand tall, proud, engaging, logical and READABLE? Which will not resemble Dr. Frankenstein’s monster when it is finally unleashed on an unsuspecting – and, hopefully welcoming — world? And … Drumroll, please … We have RAIN at last! It’s a bit unsettling, of course, to learn that one may be able to influence the Power that controls such things (see my Sept. 24 post). Wonder what else we might suggest? Then or perhaps first I’d ask for ongoing decent health, good purpose and happiness among family, friends and myself. Of course, also for ongoing support and success in my writing. Which I get from hubs, Rich, and dear others like you readers here. My “Saddle Tramps” mystery was named the No. 1 Bestselling Trade Paperback for September 2016 at Seattle Mystery Bookshop. Many thanks! Feeling the love. Should help power me through the next New West mystery story, novella or book. Tucking in a request-rider, here, to those Powers-That Be: A Seahawks Super Bowl win. Looks doable from where I sit, looking out my window at the life-sustaining rain on the Rogue Valley hills. OK, now for the Big Ask: World peace. Yes. Hello? Oh, I know. Guess it starts right here.